In the last five years, Ranthambore wildlife park has become one of the finest places to view tigers in the wild. In fact over the past years, the tigers in Ranthambore have been rewriting their own natural history. This area, a fragile paradise set between the Aravali and Vindhya ranges is about 340 kms. from Delhi. The 392 sq km of Ranthambhore National Park is perhaps Indias finest example of Project Tiger, a conservation effort started by the government in an attempt to save the dwindling number of tigers in India. Situated near the small town of Sawai Madhopur, the Park has seen its ups and downs, and there were times not so long ago when poachers were having a field day in the Park. But recently thanks to the devoted work of some good field staff the forest has been restored to its old glory and is now seen as a much needed stronghold for the tiger which is battling for survival. What is so special about this Park is the way history and forest have come together to create an amazing landscape not seen in very many places. The rich forest around the fort is littered with ruins that date back to the 10th century. Parts of the fort that lie inside the Park have been reclaimed by nature. Can you imagine the sight of a wild tiger seeking shelter under architectural brilliance on a hot summer day, or a leopard standing majestically on the walls of the old fort? Ranthambhore has a wide variety of dazzling landscape to offer. The most frequented areas in the Park are around the beautiful lakes where a large number of the wild conjugates. One also gets a chance to drive through rolling grasslands, rushing streams, open scrubs, heavily wooded valleys and through deep ravines walled on either side with steep cliffs. The Park was declared a wildlife sanctuary in 1955 and as a National Park in 1980, seven years after the launch of Project Tiger. In 1984, the southern and northeast forests were declared as Sawai Man Singh and Keladevi sanctuaries. Before Independence, the forests of Ranthambhore were the preserve of the maharajas of Jaipur who frequently hunted here, and royal hunts go back to the 12th century AD. These forests were the favorite hunting grounds of Prithviraj Chauhana, a Rajput ruler whose hunting zeal took him into other rulers lands and consequently into battle! In recent times, Britains Queen Elizabeth and Prince Philip were Maharaja Man Singhs special guests in 1960. Valmik Thapar in his book The Tiger's Destiny talks of the inhabitants of Ranthambhore fort as people who lived freely and easily in the forest. They revered the sun and the moon and were great worshippers of Vaghdeo, the tiger god who propitiated throughout the forest as lord of the area. They believed in a world of ghosts and spirits and wore a variety of charms and amulets to ward off evil ones. Even today, some of the villagers around Ranthambhore still have a bhopa (medicine man). The older generations remember their worship of the tiger and some cattle herders still ask for the blessings of the tiger god before taking their cattle to graze in the forests. The indigenous residents of the Ranthambhore forests were a people called the Minas. It was their custom to mark the forehead of a new ruler with the blood taken from the thumb or toe of a member of a particular family in the tribe. This seems to have been an expression of their right to accept or reject their ruler. Ranthambhore forest is dry deciduous with dhok (Anogeissus pendula) trees as the main vegetation which is an important fodder tree for animals. Kulu (Sterculia urens), ronj (Acacia leucophloea), ber (Zizyphus maudrentiana), khimi (Manilkara hexandra), tendu (Diospyrous melanoxylon), polas (Butea monosperma), peepal, mango and banyan are prevalent in Ranthambhore. But perhaps the most spectacular is the flame of the forest which blooms in April, enveloping the forest in a spectacular fiery red aura. The four lakes in Ranthambhore are surrounded by a numerous species of trees like salar (Boswellia serrata), gurjan (Lannea coromandelica) and gum (Sterculia urens). Among the more fascinating features of Ranthambhore are the banyan trees, some of which are known to be at least a 800 years old and are mentioned in ancient texts. Ranthambhore can also boasts of the superb specimen of the banyan tree that casts its magnificent canopy behind Jogi Mahal, the old hunting lodge by the lake built in the latter part on the last century by the Maharaja of Jaipur. 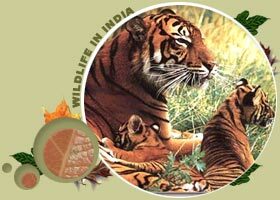 Ranthambhore National Park spans an area of about 400 sq km with a tiger population of about 32. The tiger is relatively easier to spot in Ranthambhore than in many other National Parks, thanks to the tourist friendly nature of the tigers and the openness of its surroundings. The Park also supports a large number of other wild species including leopards, the highly endangered caracal, jungle cat, hyena, jackal, sloth bear, wild boar, marsh crocodile, porcupine, common langur, spotted deer, Indian gazelle, sambar (Asiatic stag) and nilgai (bluebull). Some of these species (especially the nocturnal ones like the leopard and the caracal) are difficult to spot and sightings are rare, but then that is bound to happen when every eye in the Park is looking for what Ranthambhore is best known for  the tiger. The langur is the only primate found in Ranthambhore and is abundant in these forests. It is not the tiger's best friend. Actually it is a source of great annoyance to the tiger, since it has a remarkable eyesight and from its high perch it can spot the slightest movement; its shrill alarm call effectively warns all the other animals of danger. But if you are looking for tigers you should be listening carefully, a langurs alarm call or for that matter a chitals (spotted deer) call might be a good indication of the presence of a tiger in the area. Another animal that is sure to come you way in Ranthambhore is the sambar. It is among the tiger's favourite prey. Largest of the Asiatic deer, the sambar stands some 1.5 metres at the shoulder and weighs more than 270 kilograms. Ranthambhore is also rich in migratory, water, and woodland birds. There are about 270 species of birds in the Park including a large number of migratory birds. Some of the many varities of birdlife to be found here are the great Indian horned owl, various species of eagles such as Bonellis eagle and the crested serpent, spoonbills, partridge, quail, parakeets, kingfishers, owls and storks, geese and ducks. But perhaps the most visible bird in Ranthambhore is the peacock, India's national bird. Every evening the peacocks of Ranthambhore line up on the walls of the fort which stands on a cliff above the Park and, after much calling, descend to specific roosting trees for the night. Seen in its natural habitat, the tiger is one of the most fascinating beasts in the world. It is also almost invisible, be it in greenery or brown bush. And the tiger has this amazing ability to sneak up on its prey without the slightest sound, even while walking on dry undergrowth. When God made the tiger He made Stealth and Invisibility the two chief characteristics of this fascinating Lord of the Jungle. But theres a catch. While a tiger lies in the bush it is almost impossible to see it  it stays perfectly still without a sound. Except for its tail, which he can never hold still however hard it tries. In the early 20th century there were about 40,000 tigers in the Indian subcontinent. That was before royal shikars became a cult for the princes of India. Perched safely on elephants and machans, they hunted the tiger with a zeal never seen before. Clad in khakis and wielding high caliber rifles, even the British blasted away with a view to `bag a tiger. Royal Hunts were an experience in themselves, and the term `hunt was more or less brought to shame. While Jim Corbett hunted his maneaters on foot, camping in dense forests for days accompanied only by his rifle and his dog, the maharajas found another way to bag their game. Each state had its own army, and with battles buried in the past these armies were used to draw out game. Hundreds of men armed with weapons, drums, pots, and pans  whatever made a noise  would step into the jungles. Then would begin the noisiest `safari a forest had seen, the ultimate goal being to drive animals out to where the royalty waited to blast away with guns. Imagine the plight of a scared animal trying to run away from all that hullabaloo only to be shot down. And all this was called a haanka. The Park is open from October to April, after which the monsoons make it impossible to enter forests as the muddy trails are washed away. The best times to view wildlife are the early mornings and evenings, as fixed by the forest department, and in Ranthambhore there is a fairly good chance of spotting a tiger. A network of four tracks crisscross the park. A maximum of three open jeeps are allowed on each trail at a time. There are open roofed canters (small trucks) but these are not very good for viewing wildlife as they seat 20 people who can get really excited on seeing an animal and scare it away. Also, canters are shaky vehicles and photography is nearly impossible from them because their drivers stop and start on their own whims and without warning. Rides into the jungle in open jeeps is pretty safe as most of the wild animals are accustomed to human presence. Open from October to July. Visits are regulated by the reserve management. Private vehicles not permitted.